Pots without fused glass are microwave, dishwasher and oven-safe and are meant to be used as such. Pots with fused glass are food safe in the way that they are not toxic in any way. However, that neat little crackle pattern in our pots with fused glass, is really a bunch of cracks. Food particles may find their way into the cracks, leaving a stain or allowing bacteria to grow. Therefore, we tell our customers that the “glass pots” are for dry foods only, such as bread, cheese, grapes, etc. They should be hand washed after use & often are described as decorative only. When ordering pots with glass, please understand that the glass starts out clear & the interaction with the glaze is what changes the color. 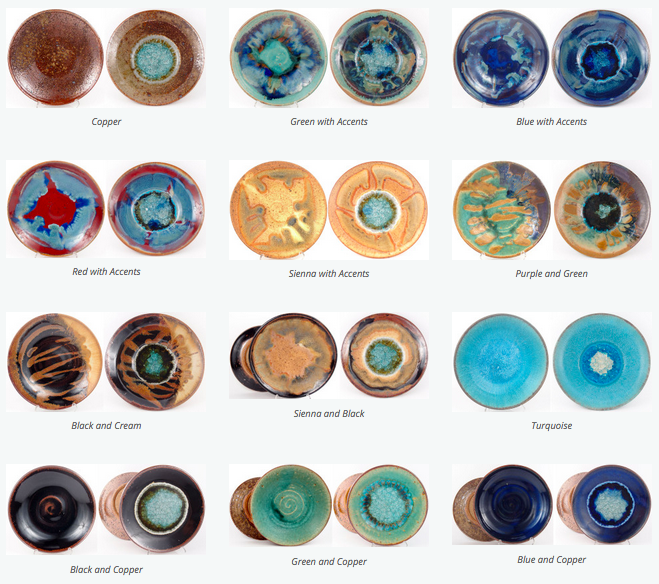 We do not have any control over the final glass color and consider the variations to be what makes our pots extra special. When you place an order for a “Green with Accents” bowl, you are referring to the glaze and not the glass. For general questions, please email info@dock6pottery.com.